My father was a wood sculptor. I spent my childhood surrounded by his tools and sharpening bits. He could put a razor edge on piece of cardboard and read grain direction from 10’ away. He could get a glass smooth finish on an end grain cut of the hardest wood with just a handful of nowhere near flat oil stones and a buffing wheel. He taught me a lot. More than I realize now that I am “up there” in years. One thing was how to put on edge on most any tool…by hand. I use similar tools. A small collection of stones, though I have changed to diamond and ceramic and all water based as well as a buffing wheel. I had to change my tune when I started making furniture. Furniture needs sharp, but it also needs straight and flat. So though I am certain my dad had a chuckle from above when I did it, I started using a honing guide for joinery chisels. I bought one of the cheap ones and it worked well for flat chisels and plane irons. But…”well” is a long way from “great” and “amazing”. I was accustomed to an amazing edge. So I upgraded. I splurged for the expensive Lie-Nielson guide. The point of all this rambling is to tell you that indeed it is worth the $125. Do it. Get it. It has one slot that takes small chisels and wide plane irons, so you only need one angle guide. When tightened it stays tightened. The roll is flat, smooth and offers no objection to the stone. Though I don’t need them, jaws are offered that take other oddball chisel types. In terms of things in my kit that I think “wow, this really is amazing”...this is one of them. So if you are looking for a honing guide, get the best and you won’t regret it. As to my dad’s tools, I have over 100 chisels, most of which are from ancient and obscure foundries. His flat bevel chisels were impossible to use with a guide as they had long since been taken to impossibly shallow angles and odd bevels to suit the job of the day. Later in life he would use a worn out belt sander belt as a honing tool, doing things with it that I still can’t reproduce. Oh well. 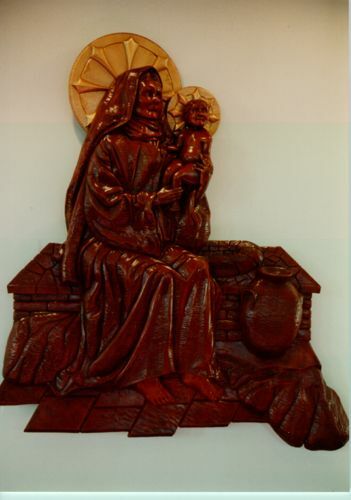 Mother and Christ…commission for a Greek Orthodox Church in New York…1970’s when mahogany was plentiful. It’s a beautiful tool. I’ve had the veritas for years. Never been able to justify making the jump to add the Lie-Nielsen although I would love to have one. Thank you for the review. It certainly looks like a nice tool to have. The sculpture your father made looks great. 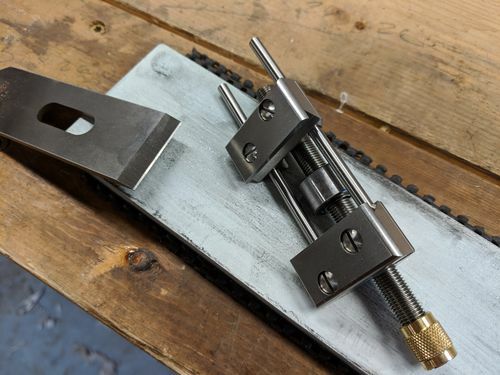 I know us readers would love a blog about his work and tools. He was an avid photographer and record keeper indexing his work, number in the thousands. I have all his slides and one day will send them off to be digitized. Great tools that actually work are always worth their price. I wish I knew that when I first started out in woodworking. I have a Veritas honing guide which is pretty good, but I really love the leather honing wheel on my Tormek. I get pretty long life from my edges by just honing them with the diamond paste and only occasionally sharpening. Admittedly the Tormek is not as good as water stones and probably ceramic as well, but the edges I get with it are good enough for the work I do (which isn’t much these days).